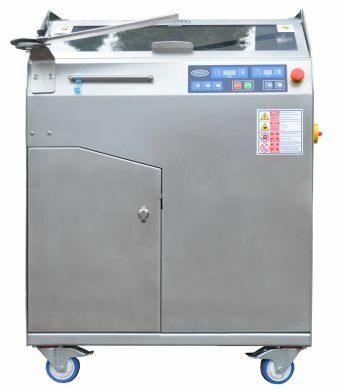 To meet the needs of customers, we have introduced the production of RAMZES slicer, intended for cutting various kinds of bread to slices with a thickness of 4 to 20 mm. 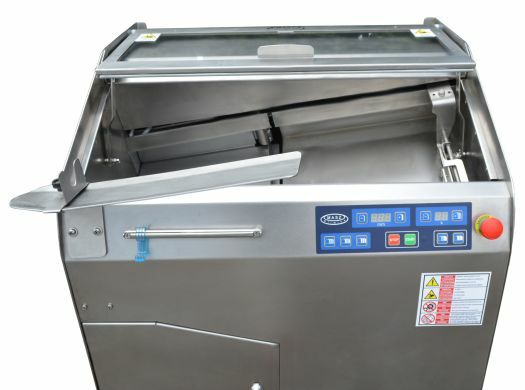 This device is sliced bread placed in the chamber by the two procedures (which is clearly seen in the control panel) automatically (adjusts the thickness and the number of slices according to the established and stored in the device memory program) or as option adjustable manually (allows precise selection of film thickness and number of slices for example, . in the store, according to the indications of direct customer). Programmed maximum number of slices, which can cut bread, is 99 units (increasing the thickness of the slices are made of 1 mm). It is also possible to cut the loaf into two halves. 1.	drive mechanism of the cutting unit (performing rotational movement), moved by angular gear motor. 2. Disc cutting blade (round knife) carbon steel coated with Teflon (it can cut the bread fresh. 3. Feeder bread (loaf supply to the knife), performing reciprocating motion. The cutting unit does not require lubrication. Slicer is dedicated mainly to work in small bakeries and stores (for use by staff but not by customers) and provides for the possibility of building over the furniture. All our products are manufactured in compliance with the applicable CE standards.